Artisan Bakery featuring fresh breads, healthy sandwiches and tasty treats! Breakfast buffet till 9:30. Also Gourmet Sunday Brunch starting at 10am! Beef, chicken, Elk, veggie... Families welcome! Gourmet burgers and great drinks! How can you go wrong! From Creole Jambalaya to Rajun Cajun Shrimp. Very nice! Try the Athenian baked stuffed chicken breast. mmm! Red or Green Curries. Beef, chicken or tofu. Nice prices too! 20 kinds of frozen yoghurt/sorbet, yummy toppings and waffle cups! Fish & Chips, Shepherd’s Pie and more... Canadian style! Fantastic fondues from Swiss cheese to beef & seafood! Authentic Alpine cuisine, including Schnitzel and Fondue! The Rocky Mountain Greek Platter for two is a great sampling! Great noodles hidden on the 2nd floor - Sundance Mall! Steak & Guinness Pie, Irish Stew and much more! Italian - La Terrazza (403) 762-4433 • 222 Lynx St. • Menu. 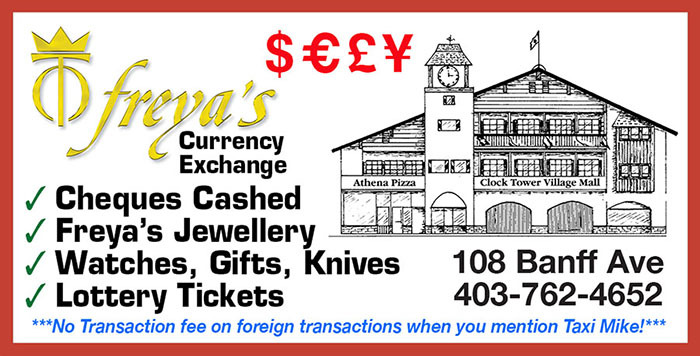 Enjoy authentic Italian cuisine with an Alberta twist! Japanese - Sushi Bistro (403) 762-4000 • 208 Caribou St.
Quaint new Japanese restaurant with great sushi and nice prices! Their signature dish Arni Psito (Roasted Lamb) is fantastic! Serving gourmet burgers till 1:30 am! Pizza, subs, tacos, wings, poutine, donairs... delivery till 4am. 27 ingredients underneath melted aged cheddar & other goodies! Noodles - Ramen Arashi (403) 760-0908 • 2nd fl. 215 Banff Ave.
Raved about by the locals! And the locals know noodles! Great selection of home-made sandwiches, piled high with the goods. Featuring homemade Italian pasta, pizza and more! The Taxi drivers choice! They make a mean poutine as well. Free delivery! The local French Canadian choice at the Banff Inn. Slow cooked on the rotisserie! Full rack, half rack or w/chicken! Nice selection from Caesar to Arugula & Squash! Fat, just like you expect them. Eat in or take out. The name means Fiddler Crab. Very nice Creole style Bistro. Sushi - Sushi Bistro (403) 762-4000 • 208 Caribou St.
You have to choose from the 42 types of sushi and more! Excellent selection of classic dishes mixed with outstanding service! Great selection of Tapas that you can enjoy as a starter or a few as a main course! Very popular with the locals... hidden in Clock Tower Mall! THE Vegetarian, Vegan, Gluten-free restaurant! 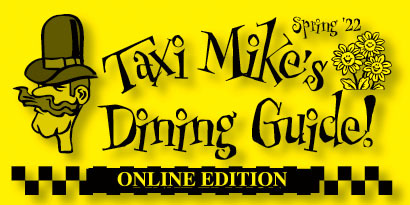 Tell your server that Taxi Mike sent ya!